Reuters reports Singapore's sovereign wealth fund Temasek Holdings has taken up a 5.5% stake in Canada's Ivanhoe Mines (TSX:IVN)(NYSE:IVN)(NASDAQ:IVN) valued at roughly $420 million. Temasek owned 40.855 million shares of Ivanhoe according to a filing to the US Securities and Exchange Commission on June 8. Ivanhoe was trading down 3.8% shortly after the open on Monday at $10.05 in New York bringing its market value to $7.47 billion in New York. The stock is down 43% year to date. Ivanhoe Mines on Friday announced the official terms of its $1.8 billion rights offer. The offer allows shareholders to buy additional shares for of US$7 or C$7.17 per share – a 32% discount to Thursday's closing price and down from US$8.34 when the deal was first announced. The proceeds of the offer will be used for the completion Ivanhoe's Oyu Tolgoi copper-gold mine in Mongolia, one of the biggest mining projects in the world. Rio Tinto took full control of the Vancouver-based miner in April in a deal that led to the resignation of the board and founder and CEO Robert Friedland who had been advancing Oyu Tolgoi for the past eight years. Two Rio insiders now head the company. Rio, the world's third largest miner, will take up all its right under the offer and also put in place a standby commitment to acquire any Ivanhoe shares not taken up shareholders who have seen the value of their holdings plummet over the last year. Rio could end up with a much bigger chunk of the closely watched miner come July 19 – in terms of the offer roughly 260 million new shares are expected to be issued representing some 35% of Ivanhoe's current outstanding shares. Although Rio has in the past said it does not want to own all of Ivanhoe, a complete takeover and delisting of Ivanhoe is not an improbability. The stock – a favourite of resource stock investors – has been been on a wild ride since hitting an all time high above $28 in January last year affording it a peak market cap of $20 billion. 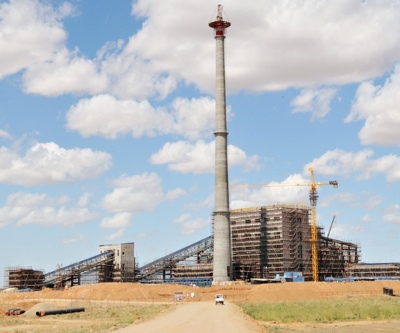 Ivanhoe has already spent over $5 billion on Oyu Tolgoi and the mega-mine is scheduled for production in Q3. Overall costs have now ballooned to $13.2 billion, up from $9.5 billion before. Ivanhoe holds 66% of Oyu Tolgoi and Mongolia's government the rest. In October Ivanhoe and Rio dodged a bullet when the Mongolian government said it was rethinking the 2009 deal and that it wanted to own half the mine. Ivanhoe shares plunged on the news, but the firm took a tough stance and after some desperate negotiations Mongolia backed off. The mine is set to produce more than 1.2 billion pounds of copper, 650,000 ounces of gold and 3 million ounces of silver each year and is almost three-quarters built. Ivanhoe also holds 58% interest in Mongolian coal miner SouthGobi Resources (TSX:SGQ), a 59% interest in copper-gold miner Ivanhoe Australia (TSX:IVA)(ASX:IVA) (whose CEO stepped down on Friday) and a 50% interest in Altynalmas Gold, a private company developing the Kyzyl Gold Project in Kazakhstan. The company had to tried to sell off these holdings to go it alone at Oyu Tolgoi, but had been unsuccessful forcing Rio to step up with funding.